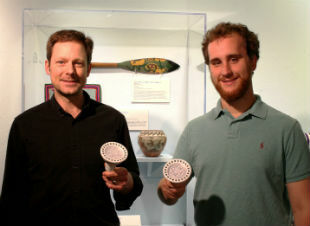 Nate Steinbrink, curator of exhibits at the University Museum, and student Wes Stoerger, graduate student in the MPA program and grant co‑writer, were recently awarded over $15,000 from the campus Sustainability Council for their project “Sustain II: National Collegiate Juried Exhibit of Art and Design for Eco Living.” Wes has volunteered at the Museum for the past two years, helping out with exhibits, serving as a docent for SIU’s annual Arts Education Festival, and cataloging at the archive. The team conceived a three-phase project which will not only lessen the environmental impact of exhibition practice in the Museum galleries, but also provide a few opportunities for the University and wider community to learn more about sustainable art. 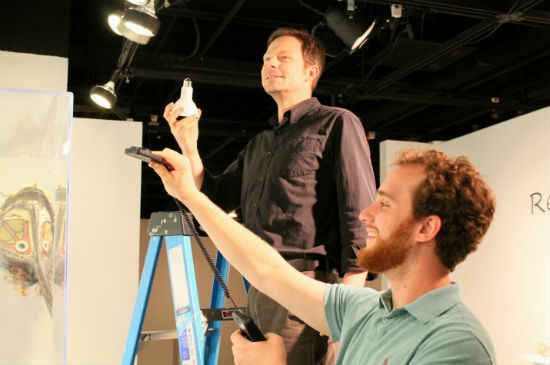 Steinbrink (holding bulb at left) and Stoerger (measuring lumens, right) are pictured installing LED lighting, which is not only energy-saving, but also kinder to the works of art being illuminated. On the day this photo was taken, discussion turned on comparisons of the quality of light displayed by various types of fixtures, and what might be done to filter some of the brighter light being emitted by the new bulbs. Although the latest LED lights are “warmer” than in the past, it still makes for quite a change in the interior galleries. The second part of the project will see a Sustainable Art Fair in the Faner Breezeway, featuring the work of Illinois artists both local and from across the state who utilize materials and/or methods with a concern for the environment. Nate and Wes hope to involve as many people at SIU as possible, drawing community members to the center of campus, to the beautiful new pedestrian walkway, and to the mouth of the University Museum. Phase three will follow later in the fall, with a visit by guest artist David Edgar, creator of fanciful aquatic life which he fashions from discarded detergent bottles and other plastic refuse. A sculptor who has spent most of his professional life working in steel and specializing in the tradition of found object assembly, Edgar brings a concern with craft to his expressive and very affordable creations. The visiting artist will both lecture and lead a hands-on workshop, culminating in a juried exhibit at the Museum to be mounted in early 2014. It is no surprise that artists have something to say about a subject as practical as sustainable living, as it requires both imaginative vision and creative problem solving to chart a greener course. Artistic gifts and skills can bring a vitality and aesthetic dimension to eco living which makes the choice to live more responsibly not merely prescriptive but also very appealing. Join the Museum this fall as it transforms a necessary effort into a celebratory endeavor. For more information, contact Nate at nstein@siu.edu . Other College winners of sustainability awards were Audrey Wagner, lecturer in Geography and Environmental Resources, who was awarded $3,000 to fund bicycle safety days, and Dania Laubach, graduate student in the same department and vice president of LOGIC (Local Organic Garden Initiative of Carbondale), who received $2,757 for education for visitors and volunteers to the RSO garden and site improvements. Congratulations to all.